Experimental artist and auteur Andrew Kötting creates a ground-breaking crossover between narrative film and contemporary art piece, based on the award-winning play by Hattie Naylor. The film is inspired by the true story of Ivan Mishukov, who walked out of his apartment at the age of four and spent two years living on the city streets where he was adopted by a pack of wild dogs. In a recession-ravaged city, the child’s world was dominated by deprivation and violence; his only hope was to turn to feral dogs for company, protection and warmth. Kötting’s spellbinding and utterly original story of survival draws on a range of innovative techniques, including home movies and archive to produce a montage essay on the state of the world. Lek, played by the French performance artist and actor Xavier Tchili and who starred in Köttings two earlier feature films, This Filthy Earth and IVUL returns with a mesmerising performance of a man close to the edge, buried under the weight of his own existential terrors. With trace elements of Tarkovsky’s Stalker and Samuel Beckett’s Krapp’s Last Tape the film sends the protagonist, Lek into a zone deep underground only to see him surface in the deserts of northern chile. Ultimately the film inhabits a foggy no-man’s land between documentary and fiction, essay and narrative whilst at the same time probing for answers to the universal questions of Where now? Who now? When now? A film by Andrew Kötting. On general release from Fri 8 Jun. 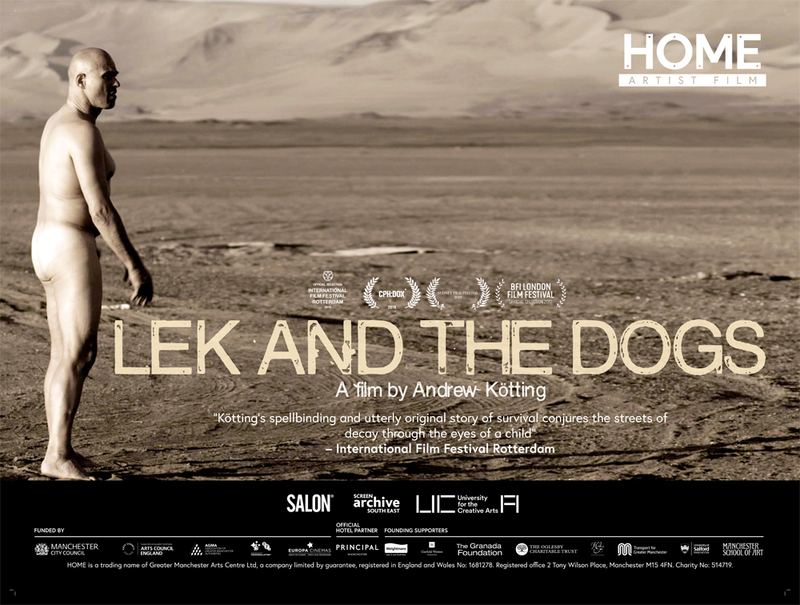 Lek And The Dogs is a HOME Artist Film. Click here to download the quad poster. We will be joined by director Andrew Kötting for a Q&A following the 18:10 screening on Fri 8 Jun.